Last Saturday September 1, I was on my way to Sucat from Alabang. I took an ordinary bus from Star mall and arrived at Sucat exit fifteen minutes later. When the Conductor yelled “Sucat diyan” I got off the bus and looked at the oncoming traffic and behind me because I was about to cross. Behind me I saw a ‘no jaywalking’ sign, I thought to myself, it’s a good thing I’m not jaywalking because the barricades were set up in a way that it seemed to be the right place to cross. I looked across the street and saw ladies in green I gave them a look and a sign that I was about to cross, they didn’t do anything. I didn’t want to run away because apparently I did jaywalk. The lady took me to their tent a few steps away. Almost like an office was set up there. I apologized to the hepe of the traffic enforcers (DANTE LOPENA) and told him what I told the lady, that I didn’t see any signs. He told me that there was a big sign there on the barricades. I was getting irritated and said that it wasn’t visible. Cars were blocking the sign when I was about to cross, and I also told him that the bus dropped me off there. He told me that the driver of the bus didn’t do anything wrong because that’s the proper stop for the busses. 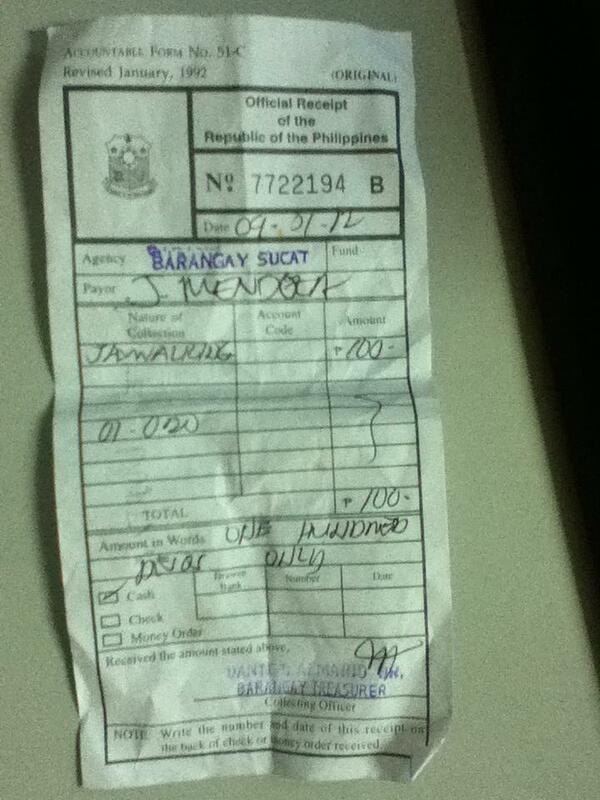 He made me read something that said something like the penalty for jaywalking is P100. In the middle of our conversation another guy was caught, he read the paper and immediately paid the penalty perhaps because he was in a rush, as most people would be passing through that intersection. The hepe had a notebook with a tally on it. He put a stroke in and I noticed there were about 50 strokes on the tally for that day and it was only 2pm. I put all of it together then and there and gasped. I told him that this is crazy. But he wouldn’t listen and he just kept on saying “konting abala lang naman. kaya mo bayaran yan”. This is a form of entrapment, the signs are messed up, there are no signs that are clearly visible and the people that were suppose to stop me from crossing waited for me to cross. The barricades were set up in a way for you to cross there and the busses and jeeps are made to stop there. He told me that he will be issuing a ticket, but even so. It would just say “jaywalking” he could easily just say that I jumped a barricade or something. I finally paid the penalty but got his name. I told him that this was unfair. He confidently wrote his name down and issued me a receipt. I just paid the P100. I couldn’t do anything else at the time. To the public I may seem like someone who is just looking for someone to blame, another average law breaker who points fingers, a brat that doesn’t own up to his mistakes. But if you zoom out and look at what is happening here. It is a form of corruption. Entrapment and who are the victims? The everyday commuters, the average Filipino worker, imagine how much they get if every 5mins they catch someone jaywalking. With the proper signage and positions of barricades this will not be happening. Look at the Bicutan exit as an example; they have the overpass foot bridge and proper enforcement. The commuter’s traffic flow is smooth. With all the money that they get why don’t they set up a system like that? And they say that the people just lack discipline and don’t read and just ignore the signs . What pissed me off even more is that I told my friend about this and the same thing happened to him a month ago. I hope this will be stopped, and I do hope someone does something about this. It’s cliché to say that this is one of the reasons why we, as a country can’t get out of corruption. But it is! Ang kapwa mo linoloko mo. Pineperahan mo. Please look into this. I’m just not sure what department. But they were wearing green. Please take care! Please share if you can. Thanks for taking the time to read this. — at East Service Road, Sucat Toll Exit, SLEX. The Village Bazaar this weekend! Start shopping now! Next story Job seekers in Paranaque, read this!